AA PA#2 Quaker Valley boys scored all seven in the top sixteen to win the MAC championship with 26 points. Quaker Valley's John Yankello out leaned West Allegheny's Brad Hough for the individual championship, both clocking 16:59. The Moon Area girls managed to halt the Quaker Valley team championship double, beating Quaker Valley 56-78, but placing all of their seven girls in front of Quaker Valley's #4. Blackhawk's Angelica Peck won the individual championship for 2009 with a time of 20:01, 30 seconds better than the field. In the Northern Div which was dominated by LaSalle, Tom Kehl from Judge took the race out very quickly running the 1st mile in 4:50 – he was followed by LaSalle’s top 5-6 runners and Chris Muldoon from Wood at 4:55 – 5:03. That group of 8 runners distanced themselves from the field in the very difficult section of the course (Parachute Hill ) the inside loop at Belmont Plateau. As they came out of the woods, Kehl looked like the early pace was getting to him as he ran up the last hill with about 1K left to go. LaSalle also came out looking tired with 5 runners within 20 seconds and their 6th man just off the pace. The results speak for themselves. If LaSalle runs like that at Manhattan they would have been a lot more competitive... probably in the top 5 -7 teams. The Southern Div race was entirely different – With Chris O’Sullavan the consummate team player hanging back with SJP’s top 4 runners the 1st mile was between 5:12-16 for a group of 5 Cardinal O'Hara runners and 6 St. Joseph's Prep runners. As they crested Parachute Hill, Matt Cheung was in the lead closely followed by O’Sullavan, Garrity, Bilotta,Savage, Wolff, Murphy and Hess. Coming out of the woods, Cheung was still in the lead followed closely by O’Sullavan , Hess then Wolff. O’Sullavan put on the after burners to finish 1st, followed by Cheung 16:49 (37 second PR) Wolff 16:59 (33 second PR ) and Hess (21 second PR). In the girls Southern Division, Brittany Boyer (21:00) led nine Cardinal O'Hara girls across the line separated by 56 seconds before anyone's first runner to score a perfect 15 points. The United Boys placed their scoring five in the top eleven to narrowly escape with the boys county championship 47-51 over Blairsville. The individual county crown went to Alex Woodrow of Marion Center, who ran 17:49.6 for the gold. In the girls race, a 3-4 performance from Veronica and Jean Budjos was good for Indiana to take the girls team county title by 21 points. Homer Center's Angel Piccirillo ran 20:15.1 to take the individual county title. PA#5 Baldwin boys were dominant on their home course, scoring 22 points in the Boys AAA scoring with 1-2-4-7-8, separated by 49 seconds. Matt Cecaia (16:39) and Bobby Bishop (16:53) led the purple 1-2 charge. In Boys AA, South Fayette defeated South Park 235-289. South Fayette was led by a 16th place finish from JC Patton in 18:04. Canon-McMillian girls placed four in the top 20 to hang on for the 72-79 victory over Upper St Clair. Bethel Park's Hillary Boxheiner was the individual winner, running 19:34 and winning by 3 seconds. In Girls AA, South Park was able to do what their guys couldn't do, and that's beat South Fayette 214-240. South Park was led by a 12th place finish from Hayley Pisarcik in 21:03. An individual title from Waverly's Will Mullen was not enough as Sayre was able to overcome his victory and win the boys team title 32-35 by placing four in the top ten. The Sayre girls did not have the same drama as their boys did, as they won the girls team title by ten, 25-35. Hanna Robinson led Sayre with an individual title, running 20:25. PA#8 Unionville senior Matt Fischer returned to the big meet scene for the first time since a stress fracture sidelined him late last spring, and crossed the line with teammate Glen Burtkhardt, both timed in 16:04 - and taking 2nd and 3rd respectively. Unionville's guys also captured 9th, 12th and 21st to tally 47 points and defeat Salesianum by 27. The Unionville girls were led by the 10th place finish of Kathleen Insetta with here 19:01 to lead her team to a 4th place finish. PA#5 Cumberland Valley Girls and PA#7 Cumberland Valley Boys both braved the rain and cold and came out with league team championships. However, the boys had a much easier time of it than the girls did. The boys used a 56 second spread between their top five to score 65 points and defeat runner up Carlisle by 46. The girls had a tough challenge from Chambersburg, who had a better spread than Cumberland Valley (56-62 seconds) and had three runners in the top ten compared to Cumberland Valley's one. However, Leigha Anderson's individual league championship performance proved to be the difference, as she led her team to a 58-62 victory. Anderson won the league title in 20:18.37, while Gettysburg's Michael Beegle added more hardware to his trophy case with a league championship running 16:45.29, the only guy to break 17 minutes in the rain. West Allegheny Boys scored their top five in the top eighteen to cruise to a 55 point victory over Elk County Catholic, 54-109. Brad Hough brought double gold for his West Allegheny teammates, winning the individual title in a wet 17:16. Elk County Catholic was able to get redemption for their boys, winning the girls team title over Knock 74-79, despite having a 3:34 spread. Kady Weisner completed the girls double for her team, winning the individual gold in 20:10. The Malvern Boys won their seventh consecutive Inter-Ac Championship, scoring 35 points to defeat runner up Episcopal by 13 points. Chestnut Hill Academy’s Dustin Wilson took home the individual championship in 16:33. 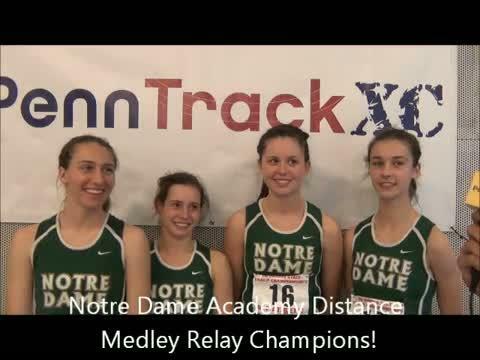 The Notre Dame girls won their fifth consecutive Inter-Ac championship, scoring 18 points with a 1-2-4-5-6 performance. 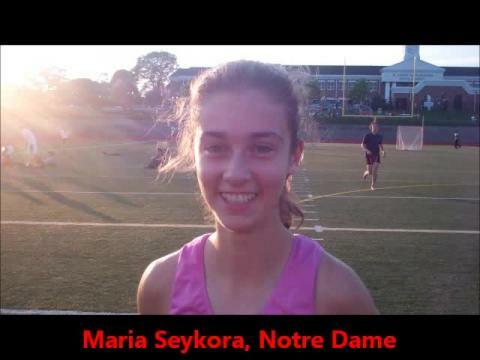 Maria Seykora led Notre Dame by winning the individual championship in 19:35.8. PA#3 Altoona was one point shy of a perfect score, going 1-2-3-4-6-7-8 with a 28 second gap. Chris Fischer and Wade Endress finished the race together with a time of 17:31. The State College girls did pull off the perfect score of 15 points, and their first five runners were separated by 38 seconds. Lucia Sofo and Chloe Schmidt finished one second apart, with Sofo running 20:25 and Schmidt running 20:26. Canon McMillan came away with both the boys and girls team county championships with sold performances from each of their top three runners. The boys had a 2-3-4 finish lead them to 28 points, while the girls had a 3-4-5 finish which led them to 30 points. Individually, Mike Standish of Trinity won by one second (16:52) over Canon McMillan's Travis Arrigoni, while Peters Township's Kayla Keddal won her race by 72 seconds, running 19:34. St Basil’s Academy won their 6th consecutive league championship by edging out host Mount St. Joseph’s 51-57, placing three in the top ten and winning despite Mount St. Joseph’s having the league individual champion Tori Perri run 18:40. PA#1 Germantown Friends cruised to a perfect score of fifteen points and the first six places overall to win the league title. Gus McKenzie led the way with the league individual championship with a time of 15:59. The girls of Germantown Friends completed the Friends League team double, placing 1-4-5-7-10 to score 27 points and win the team championship. Jasia Kaulbach won the individual gold medal by nearly a minute, running 19:34. Warwick placed five in the top eleven 75 seconds apart to cruise to the girls team championship with 33 points, winning by 52. Kayleigh Perry of Eastern Lebanon County cruised to yet another big meet championship, winning the league championship in 18:52. In the boys title race, Cedar Crest managed to win the team championship despite runner up Manheim Township placing all seven in front of Cedar Crest’s number 5. Cedar Crest used a 1-3 finish from winner John Jackson (16:44) and Alex Galli (16:56) to score 99 points and win by 17. The first upset of the conference championship week came from the PA#3 Emmaus girls, who defeated unanimous PA#1 Liberty 32-67. Emmaus put their scoring five in the top eleven and were separated by 83 seconds. Liberty’s Amy Darlington won the individual championship, running 18:50.6 to win by four seconds. In the boys race, Parkland placed three runners in the top ten to win the boys team championship over runner up Easton 59-75. Matt Kacyon of Whitehall continues to win big meets, taking the individual league championship in 16:35.9, the only runner to break 17 minutes on the day. Stroudsburg used a 1-2 finish from individual league champion Matt Valentin (17:24.6) and runner up Matt Pfaeffle (17:42.2) to lead their team to the team championship with 30 points, defeating Pleasant Valley by 23. In the girls race, Stroudsburg completed the team championship double, but had to hang tough to defeat Pocono Mountain East 37-44. Stroudsburg survived a 1-2 finish from Pocono Mountain East’s Abigail Ross (20:32.5) and teammate Sophie Conklin (21:01.8) by going 5-6-7-9-10 with a 56 second spread. AA PA#4 York Suburban go 3-6-7-8-9 to ease to a league championship in the boys team race. York Suburban’s top five boys were separated 19 seconds. Individual championship honors went to Dallastown’s Charles Lockwood, who ran 15:48.94 for the victory. In the girls race, York Suburban completed the team championship double going 2-3-10-11-13 for the win. 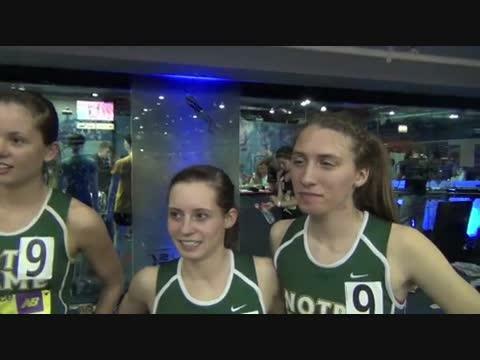 Kady Scrann of York Catholic won the individual league championship in19:18.96, winning the race by 24 seconds. The girls race was the closest of the two championship races on the day, as three teams were within six points of winning the team title. Muhlenberg High School had four in the top 13, but with their fifth runner scoring 34 points, they finished 3rd with 71 points. Governor Mifflin had five in the top 24, and were able to get second by one point over Muhlenberg with 70 because of the closer gap with their 1-5 runners. But in the end, Exeter took the team title with 65 points, going 2-3-6 to give them the advantage and the championship. 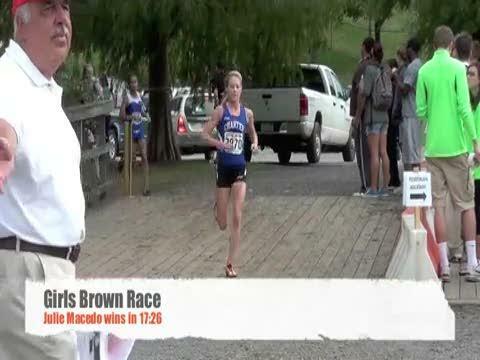 Maggie Lawrence of Wilson took the individual championship with a 13 second victory, running 19:31. In the boys race, Conrad Weiser continued to run consistently and came away with a convincing team championship win with 54 points, beating Exeter by 18. Conrad Weiser placed three in the top 10 and four in the top 11. Logan Mohn of Governor Mifflin came away the individual championship, running a solid 16:13 to win by 9 seconds. Holy Redeemer placed three in the top ten, including individual champion, freshman Rachel Sowinski (19:31.18), to score 64 points to defeat Dallas by 22. 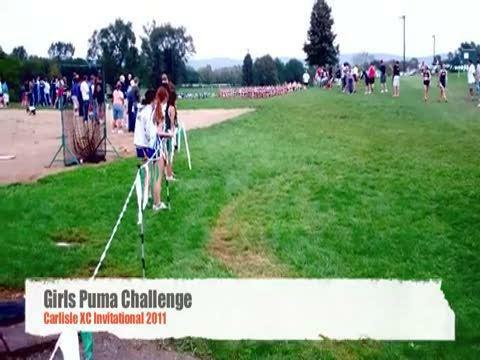 In the boys race, Dallas was able to win the team championship with eight in the top 23 with a spread of 18 seconds between 1-5 and 41 seconds between 1-8 to score 63 points. Reece Ayers of Tunkhannock won the individual championship by four seconds with a performance of 16:41.24. Bishop Canevin pulled out a close invitational boys team title with a 97-107 win over Beaver Area. Bishop Canevin used an 80 second spread and three runners in the top 20 to get the win. Individual honors went to Laurel’s Evan Miller, winning the race in 17:42. In the girls race, Center squeaked out a four point victory over Beaver Area, who completed the runner up team double. Center placed four in the top fifteen to get the small margin. Freedom Area’s Julia Kubica won the individual title in 21:11, winning by 21 seconds. Central Cambria cruised in both team races to win both team league championships. The AA PA#2 girls squad won by 32 points with a score of 30 points, placing four in the top seven, including runner up Alyssa Brandis. Leah Anne Wirfel of Forest Hills continues to overwhelm the competition, blazing to a 18:13 and a 67 second league championship victory. Central Cambria’s boys team placed five in the top 19 to win by 40, 51-91 over Westmont Hilltop. Individual championship honors went to Bishop McCort’s Chad King, who ran 17:12 to win by 11 seconds. Indian Valley won both team titles and both individual championships on their home course. The boys were led by Alex Monroe’s 16:40 performance, which was 55 seconds better than anyone else and his team had three other runners in the top ten to secure the 35 point victory. The girls were led by Brooke King, who ran 21:17 and also led four in the top eight to also win their team title by 35 points. Boyertown got the best of Perkiomen Valley in both team races to complete the team championship double. The boys survived a 1-2 finish from league champion Perkiomen Valley’s Vince Perozze (15:31) and Scott Armstrong (15:52) by placing their scoring five in front of Perkiomen Valley’s number 4 runner to win 48-51. The girls used the combination of a dominating performance from league champion Liz Simpson (18:08) and a 22 second spread between their number 2 and number 5. North Schuylkill girls go 3-4-5-7-8 with a 32 second spread to earn the team championship with 27 points. Schuylkill Haven’s Alyssa Miller took home the individual championship with a time of 21:27 to win by 11 seconds. In the boys race, Blue Mountain also won in dominating fashion, going 1-3-6-7-9 to score 26 points and win 69 points. Tyler Rauenzahn led the way to the team title for Blue Mountain, running 17:09, winning by 20 seconds. Jenkintown (Constitution) and Holy Ghost (Independence) won their respective boys division team titles, but Holy Ghost had the best team score of the day. Holy Ghost placed 3-4-6-7-9 with a 21 second spread. Individual championship honors went to John Shope of Phil-Mont Christian with a time of 15:54 to win by 38 seconds. Christopher Dock took home the girls team championship with 41 points, placing four in the top nine, including an individual league championship from Janine Powis, who ran 19:26 to win by 43 seconds. PA#2 West Chester Henderson (National) and PA#8 Unionville (American) won their respective boys division races, but Henderson had the best overall score on the day, outscoring Unionville 31-46. Henderson went 1-2-5-8-15 with a 52 second spread, despite Unionville’s 42 second spread. Will Kellar of Henderson had the best time of the day, running 16:06 to beat teammate Achraf Khattabi by 4 seconds. For the girls, PA#10 Downingtown East defeated West Chester Henderson 44-45 in the National Division race, but when you factor both races together, Henderson beats Downingtown East 68-69. Downingtown East had a 42 second spread for their top five, while Henderson was helped by the performance of Janie Augustyn, who ran the fastest time of the day in 18:48. Unionville won the girls American Division race. AA PA#3 Northwestern Lehigh girls placed their scoring five in the top 14, including league champion Lindsay Kerr (19:23.6) to comfortably take home the team championship over Saucon Valley 38-54. In the boys race, Notre Dame Green Pond had no trouble winning the team championship with a 1-4-6-7-8 finish for 26 points. Bryan McGee led the way to the team title, winning the individual championship in 17:15.5. United girls survived a strong push from Marion Center, but United was one or two places better at every scoring position than Marion Center, and won the team championship by 2 points, 49-51 behind the 4th place finish of Kelsey Isenberg (Photo by Bob Piccirillo). The individual league champion had no trouble winning, as Angel Piccirillo ran 19:24.8 to win by 73 seconds. The United boys completed the league championship team double with less dramatics, defeating Laurel Valley 38-57 with four runners in the top ten. Alex Woodrow of Marion Center took home the individual league title, running 16:45.2 to win by 54 seconds. North Allegheny took home both team championships in the 50+ team fields at Cooper’s Lake. The PA #4 boys team pulled out a 12 point victory, 66-78, over PA#5 Baldwin. Not only were they led by a individual championship performance from Ryan Gil in 15:38 (12 seconds better than Rad Gunzenhauser of Mt. Lebanon), but their number five guy finished ten places in front of Baldwin’s number five to bring home the title. The girls had a much easier time winning the girls championship, outscoring runner up Oakland Catholic 144-208. North Allegheny used a 50 second spread and placed five in the top 41. The individual girls champion was Elaina Balouris of Hampton, who ran 18:47 to beat out Margo Malone of North Hills by seven seconds. Wissahickon survived a 38 second spread to defeat Upper Dublin 48-52 to win the boys team title. Wissahickon’s counter punch was a 2-3 finish up front in front Upper Dublin’s number one, who finished 4th. Drew Magaha of Upper Moreland won the individual division title, running 16:12 to win by four seconds. In the girls race, Upper Dublin cruised to a division championship with five in the top 8, including 2-3-4-5, and were separated by 78 seconds. Amber McAteer of Upper Merion won the individual title, running 19:26 to win by fifteen seconds. North Penn won both team division titles and were both led by phenomenal individual performances. The PA#6 boys team had a strong 1-2 performance from Brad Miles (15:24) (Photo by Tom Mallon) and Sam Bernitt (15:34) to counter runner up PA#10 Hatboro-Horsham’s 33 second spread to win the division 50-61. The PA#7 girls team defeated all three Central Bucks schools 50-67(West)- 72 (East)-74 (South) despite having a 2:25 spread. 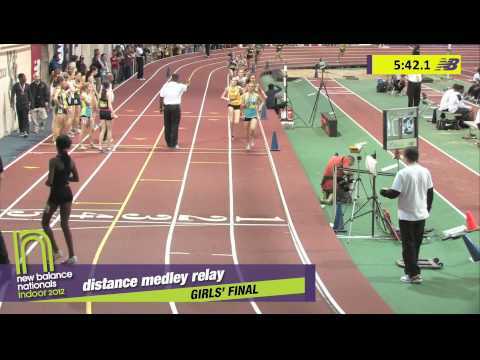 Meghan McGovern ran the fastest 5000 meter time in PA this season, winning the individual division title in 17:39, 30 seconds better than second place. Haverford High School had the top two individuals in both races in the rain and mud. In the boys race, league champion Ed Donnelly (16:38.33) and runner up (16:39.55) led the team to a team championship with 59 points to win by 28 points over Lower Merion. Sophia Meehan (19:37.14) and Tess Meehan (19:37.33) went 1-2 for the girls, but their performance was not enough to counter Strath Haven's 46 points with a 4-5-10-11-16 finish. West Middlesex came home with both team region titles, with one having an easy time of it and the other having a tougher time. The AA PA#4 girls placed five in the top 12 to score 38 points and win the meet by 18 points. Individual championship honors went to Morgan Richards of Hickory, who ran 19:27.7 to win by 16 seconds. The West Middlesex boys were able to survive a 3-4 finish from Slippery Rock by placing three in the top eight and five in the top 12 to win the meet 42-48. Jacob Kildoo came away with another big meet victory, taking home the individual regional championship in 16:28.4. Oil City boys placed four in the top ten and five in the top 13 with a spread of 68 seconds to cruise to the team region title. Saegertown had the first two finishers overall with champion Nate Tallada (18:15.4) and runner up Drew Tordella (18:23.5). In the girls race, Saegertown had the individual champion in Michele Kozubal (21:46.2) and they also won the team title with five in the top 13 and a score of 38 points. Alex Beardsley of North East continues to dominate the competition with a strong 15:44.1 to win by 54 seconds and led his team to a score of 25 points and team regional championship. The AA PA#5 North East girls escaped with a 55-57 victory over Union City. Union City had three in the top ten, but had their fifth girl add 31 team points, while North East had their top five in the top 18 to snag the two point win. Union City's Vicki Bem took home the individual title, running 19:17.5. Fairview boys placed their scoring five in the top nine to take home the team region championship with 23 points. Morgan Elliot of General McLane pulled out the close individual region title, running 16:57 to win by 6 seconds. In the girls race, General McLane was able to do what the guys came short of doing and that was win the girls region team championship with 28 points. Becca Wheeling led the way to the team title, winning the individual championship with a time of 20:53, ten seconds better than the field. McDowell boys was able to win the region team title by five points, 35-40, despite runner up Meadville having a 1-2 finish from individual champion Logan Steiner (16:55.8) and runner up Noah Orris (17:32.5). McDowell placed 3-6-7-8-11 with a spread of 33 seconds. In the girls race, McDowell was able to complete the team championship double with a five point victory of their own, 42-47 over Meadville. McDowell placed nine in the top eighteen, and their 7th and 8th runners managed to take enough points away from the Meadville number five runner to pull off the win. Meadville's Elisa Wilson (Photo by Carl Strub) won the individual title in 20:11.2. Northeast Bradford, Canton, and Towanda had a close battle for the boys team title. Towanda placed two in the top four, Canton placed four in the top sixteen, but Northeast Bradford had five in the top 25, including two in the top seven to edge both school 69-72-75. Wyalusing’s Taylor Woznicki won a close individual race by four seconds, running 17:35. In the girls race, Sayre and Wellsboro tied for the conference team title, scoring 62 points each. But Sayre’s number six runner finished nine places better than Wellsboro’s number six and that broke the tie and awarded Sayre the girls team championship. Susan Learn from Mansfield won another big meet, winning this individual championship in 19:38, 41 seconds better than the field. PA#9 Lasalle Boys won their seventh consecutive boys team championship with a score of 31 points, placing all five scorers in the top nine with a spread of 17 seconds. Tom Kehl of Father Judge took off from the sound of the gun and took no chances in winning the individual league championship with a solid 17:08.91 in the deep mud and wet grounds of Belmont Plateau. In the girls race, Cardinal O’Hara won their sixth consecutive team championship with a 22 point victory and were led by individual champion Nicole DelGrosso, who hung on in the last half mile to win in 21:23.58. Allderdice boys won their 15th consecutive District 8 title, whilte the girls' captured their 11th straight. The team's #1 runners, Kavish Gupta (boys) and Mari Baron (girls), each on their individual races at Schenley Oval.